The office system Bizhub 500 is a monochrome multifunction copier with print, scan, and optional fax features designed to streamline the workflow in a medium or large office. The Konica Minolta Bizhub 500 black and white multifunction printer can easily be shared by a workgroup and it can fulfil high volume printing needs, but it has been discontinued. This is a 91.2Kg device that measures 677mm wide, 895mm tall, and 708mm deep with the duplexer and automatic document feeder installed. The base unit has a 1,150-sheet capacity with two 500-sheet paper cassettes and a 150-sheet bypass feeder. There is a stackless duplexer unit with an automatic document feeding capability. The Konica Minolta Bizhub 500 copier has a 400MHz processor with a USB 2.0, IEEE 1284, and Ethernet interfaces, and runs on 384MB of system memory with 192MB of page memory. The large touchscreen panel takes up most of the control board's space, but there are additional keys for data input and one-touch operation. Text documents and graphics are printed sharply in 1200x600dpi. 3D objects and books can be scanned by the Bizhub 500 black and white MFP. This multi-tasking communication centre prints fast, with the first copy ready in 3.2 seconds. Two-sided printing is a standard feature as well as multiple copy, at up to 999 sheets. 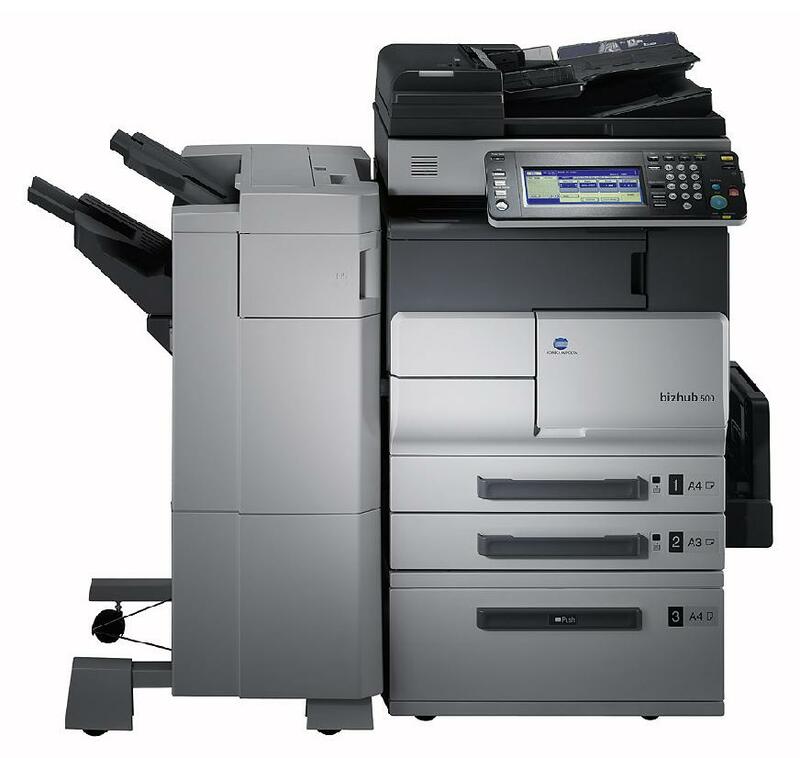 The paper capacity of the Konica Minolta Bizhub 500 multifunction printer can be increased with options. Suitable for high-volume printing, the black Bizhub 500 print cartridge features extra fine polymerised toner for page after page of professional quality printing. Production for the Konica Minolta 500 multifunction copier has been discontinued so those who own this printer might have a difficult time finding accessories, support, or consumables. The scanner's resolution is limited to 600x600dpi, so it might compromise the quality of very detailed images. Users might find the Bizhub 500 mono laser printer to be expensive, too. Fax is only optional and requires an upgrade. There are no means to upgrade the memory.